When the world's most powerful subatomic particle collider begins gathering data this summer, it will be a major milestone for a number of University of Washington scientists. The UW, led by professors Henry Lubatti in physics and Colin Daly in mechanical engineering, played a central role in designing and fabricating nearly 90,000 tubes that are key to the workings of the Atlas detector. Atlas is one of six particle physics experiments that are part of the Large Hadron Collider at the European Organization for Nuclear Research, known as CERN, near Geneva, Switzerland. "They are like little messengers that tell us a potentially interesting event may have occurred, a signal that we should look more closely at that event," Lubatti said. 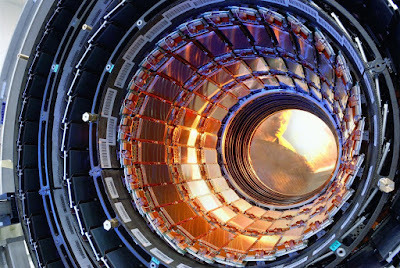 Potentially that could lead to direct evidence of the elusive Higgs boson. "That's just one example of the detector's value," Lubatti added. "There are many other interactions that produce high-energy muons, so it is very important to be able to observe these." The scientists are looking for other information that will help them to _ll gaps in what they call the Standard Model of particle physics, a framework that explains the fundamental forces of nature. The Standard Model explains the way particle interactions create the strong nuclear force, the electroweak force and electromagnetism, and how those forces work with each other, but aspects of those interactions still are not well understood. The Large Hadron Collider also could lead to better understanding of the fourth fundamental force — gravity — in terms of particle interactions, and help solve the puzzle of why gravity, while perhaps most recognizable to a lay observer, is the weakest of the fundamental forces. The collider is a successor of sorts to the Superconducting Supercollider, a high-energy collider that was to have been built in Texas. The supercollider was first proposed in 1983 and construction began in 1991, but escalating cost estimates and other factors created controversy and Congress cancelled the project in 1993, after about $2 billion had been spent. UW scientists including Lubatti, who initially worked on the Superconducting Supercollider, began working on aspects of the Large Hadron Collider in the mid 1990s. The collider, which is to begin test operations in late May or early June, will send hydrogen protons racing at nearly the speed of light in opposite directions through parallel underground cylinders that form a large circle about 16.5 miles in circumference straddling the Swiss-French border. The cylinders intersect at various points, allowing proton collisions that produce subatomic particles that can be observed by one of the six detectors, each positioned at one of the intersections. The manufacture required great precision, in some cases with tolerances of less than onethousandth of an inch, a tall order for instrument makers and machinists in the UW Physics Department. A major part of their success was designing and making the equipment that could replicate such precision. Threading the tiny wires was another great challenge. "Maintaining that kind of precision can be very difficult when you're working on scales of more than 9 feet, but we were able to do it," Daly said. "We found that students with good eyes were able to thread the wires very easily. If I tried to do it, I couldn't even see the wire."